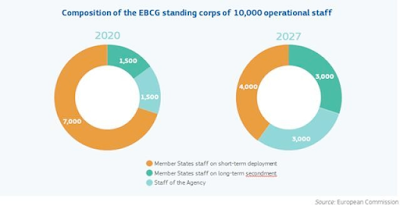 Two years after the establishment, in record time, of the European Border and Coast Guard (EBCG), the Commission’s new proposed Regulation opens the way for a standing corps of 10,000 border guards, with its own equipment and greater executive powers. The proposal was presented during the State of the Union Address on 12 September 2018. President Jean-Claude Juncker, in his speech before the European Parliament, announced the adoption of 18 concrete initiatives, among which migration and borders reform occupied a central spot. Apart from the strengthening of the EBCG, these proposals include a reinforced role for the European Asylum Agency, EASO, a stricter EU returns policy, as well as measures for safe and legal pathways for regular migration to Europe. The intentions of the Commission were expressed by Commissioner Avramopoulos himself in quite straight lines: ‘more Europe where more Europe is needed’. Frontex is perhaps the most vivid representation of this message. 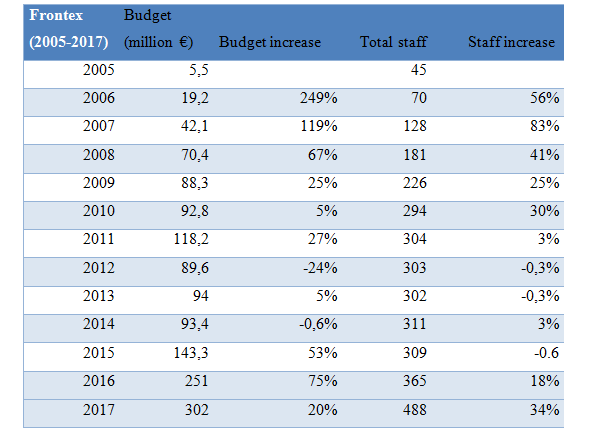 The agency has been vested with new powers and competences almost every two years since its establishment in 2004, while its operational capacity has been growing steadily, with a spike in both personnel and budget after 2015. This gradual approach was a necessary reconciliation between the Commission’s original vision of fully-integrated border management led by a fully-fledged corps of border guards on the one hand, and the sovereignty concerns of member states on the other. 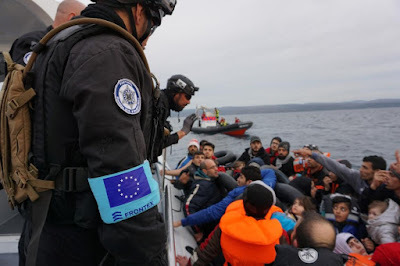 In 2016 the member states felt that the time was ripe to accept a name that symbolically limits the absolute sovereign control over their borders bringing them closer to a fully integrated scheme of border management, and the European Border and Coast Guard (EBCG) was established. It was apparent already then that this was not a completely new EU agency but rather ‘Frontex reloaded’ with ever more powers and competences and a generous budget. Already two years later, the EBCG is moving to the next phase, and the word that best describes that phase is ‘effectiveness’. The Commission aims for a strengthened and fully equipped European Border and Coast Guard that is effective and efficient enough to address the ‘capability-expectations gap’ that has resulted from the agency’s dependence on the member states for contributions in border guards and equipment. This is where President Juncker drew the line between the past and the future of integrated border management: ‘Temporary solidarity is not good enough’ he stated. ‘We need lasting solidarity – today and forever more’. The effectiveness goal is to be achieved mainly with a increased operational capacity in terms of staff and equipment, expanded operational competences, and a sharp budgetary increase. Perhaps the most monumental change brought by the new Regulation is the establishment of a ‘standing corps of 10,000 operational EU staff with executive power and their own equipment’. In order to address the vital operational issue of availability of human resources, the EBCG Regulation set in 2016 an absolute minimum of 1,500 seconded border guards and other experts that should be available at any time in order to ensure the effectiveness of the agency on short notice. This comes in addition to the European Return Intervention teams, currently involving 550 return experts. In fact, Frontex had more than 1,700 officers deployed at the EU borders in 2018 assisting with functions such as surveillance, registration, document checks, fingerprinting and security checks. The agency’s own staff has also been growing steadily, as shown in the table below. The agency started with 70 employees in 2006, while there were almost 500 people working in Warsaw in 2017. In the first months of 2018 the agency requited another 162 new staff, which means that one in three working in Warsaw were hired in 2018 alone. The goal is that by 2020 the agency will have 1,500 own staff, which will grow to 3,000 by 2027. Today’s availability is still not adequate to fill the operational needs of the agency in a predictable and expeditious manner, as it has to rely for its work mainly on border guards provided by the member states on a voluntary basis. The standing corps of 10,000 will constitute a ‘reliable intervention force’ of agency staff and seconded or deployed officers, i.e. border guards and return experts. The intention is the gradual proportional increase of the agency’s own staff and long-term deployments. The number of short-term deployments will gradually decrease in favor of statutory Agency staff and staff seconded by member states for long-term duration, as shown in the scheme below. The foundations for this amendment have already been set over the years, and member states are even more likely to support it because of the envisaged financial support system that will allow member states to replace the deployed personnel and maintain the capacity of their national border authorities. Furthermore, the costs of their salary and overall deployment will be covered by the agency. The standing corps will have executive powers similar to the border guards and return specialists of the member states. They will be able to authorise or refuse entry at border crossing points, stamp travel documents, patrol borders, and intercept persons crossing irregularly. In addition, they will perform identity checks using the False and Authentic Documents Online system, which the agency will take over from the Council General Secretariat. Finally, the power to carry weapons will extend from the deployed national border guards to all members of the standing corps including agency staff. Another step closer to improving the stability, flexibility and autonomy of the agency is the acquisition by the agency of its own equipment. ‘We need more planes, more vessels, more vehicles’, stated President Juncker. At first, such equipment was made available by the member states on an ad hoc basis, but in 2007, Frontex created the Centralised Record of Available Technical Equipment (CRATE), to which states contribute on a voluntary basis, in accordance with the needs specified by the agency. CRATE was replaced in 2016 by the Technical Equipment Pool, which serves as a record of all technical equipment available to the agency, whether that is owned by a member state or the agency or co-owned by both. However, while the contributions on paper seem to almost fully cover the agency’s needs, the actual availability of the pledged assets by the member states is more problematic, especially during the busier summer months. Therefore there is a growing emphasis on developing the agency’s own capabilities. As of 2017, Frontex had €10 million per year in its disposal (EUR 40 million in total for 2017-2020) to acquire its own equipment, while co-ownership with a member state, renting, leasing, and long-term deployments were identified as additional options in the EBCG Regulation in 2016. The agency has already started acquiring smaller pieces of equipment and running relevant leasing and rental projects, while now the goal is to move to larger items, such as vessels and planes. The Commission has now earmarked €2.2 billion of the EU budget for 2021-2027 to allow Frontex to acquire, but also to maintain and operate the necessary air, maritime and land assets. The budget allocated for Frontex notes a sharp increase. An additional €2.3 billion is proposed for 2019-2020, which is followed by €11.3 billion proposed for the 2021-2027 period. This increase is in conformity with the general direction of the last years, especially since 2015, as shown in the Table. However, the allocated budget has always counted millions rather than billions. The highest allocation until now was in 2017 with €302 million. The ‘right to intervene’ was one of the most controversial aspects of the 2016 EBCG Regulation. According to this right, the agency may launch an emergency intervention, even without the consent of the member state, if the latter does not take the measures identified by the agency in the vulnerability assessment, if the member state is faced with a crisis at its borders. If the member state does not cooperate with the implementation of the suggested measures, it’s threatened with the reintroduction of internal border checks. Precisely because of the sensitive nature of the issue, the initial proposal was watered-down in 2016. While initially the agency could intervene on its own, in the final compromise the measures proposed by the agency can be implemented by the Council upon the proposal of the Commission. The 2018 proposal moves one step closer to the initial conception, with the right to intervene being left to the Commission excluding the participation of the Council. Returns have been the fastest growing activity of the agency. Frontex acquired further competences in 2016, mainly including organising and coordinating joint return operations. This resulted to 14,884 persons being returned in 2017. Returns reached 8,966 from January to August 2018. However, the agency could not enter into the merits of return decisions or provide supporting information. With the 2018 proposal the agency may now prepare return decisions itself and provide its own return escorts. It may also assist in the acquisition of travel documents, the identification of irregular migrants, and in the development of national return management systems. The central tasks of hosting an operation remain with the member state. Finally, Frontex will be able to assist non-EU states with their return activities elsewhere, which include mixed return operations with the participation of member states. Apart from assisting non-EU countries in their own return activities, the cooperation with third countries is strengthened even further. The option to launch an operation in a third neighboring country was introduced in 2016. The new proposal allows a border control operation to be launched in any third country not limited to neighboring countries. Further, the establishment of ‘disembarkation centres’ on third countries is proposed for migrants intercepted at high sea. The concept of regional disembarkation is developed in contact with UNHCR and the IOM. Notably, Libya has for the moment turned down the idea. Frontex will participate in the deployment of migration management support teams in hotspots and controlled centres. Such centres, to be set up by member states on a voluntary basis, will act as a cetralised location for EU migration management activities and aim to facilitate and accelerate the processing of asylum claims and the execution of return decisions. All necessary steps should be concluded within a maximum of eight weeks. Frontex will work there hand in hand with EASO, which also receives an enhanced mandate, assisting in the identification of beneficiaries of international protection and in returns, while EASO will support in the processing of asylum applications. Even though the enhancement of the powers and competences of Frontex seems to come as a response to ad hoc incentives, such as the ‘migration crisis’ in 2016 or the need for greater effectiveness today, these changes are in fact far from incidental. They reflect the Commission’s longer-term vision for progressive integration that will result in a European Border Guard vested with full operational powers, effectively replacing the national border authorities. In this respect the Commission proceeds to progressively ask for the increase of the number of available border guards and budget, but it also pushes for amendments that failed to pass the trilateral dialogues already in 2016, such as the right to intervene without the consent of the member state. This is a big leap towards supranationalisation that member states have so far been unwilling to take. Greater autonomy and control over the operation, however, also moves Frontex closer to the realm of accountability. With growing executive powers and operational mandate, and direct control over the deployed personnel and equipment comes an even greater need for accountability. This is especially so given the new mandate of the agency, for instance in the area of returns, where Frontex will have the power to prepare return decisions. The Commission emphasizes that the final decision remains upon the member state. However, the complaints concerning EASO, and the beyond its mandate influence on the asylum decision-making process in Greek hotspots, sets a disturbing precedence that should not be underestimated in the case of the EBCG. Frontex operations are particularly sensitive to human rights violations, and with the individual complaints mechanism, established in 2016, falling remarkably short of the standards of an effective remedy, accountability for Frontex still remains an open end. *Update: the law discussed above was agreed by the Council and European Parliament in spring 2019. For a discussion of the final version, see this blog post from April 2019.